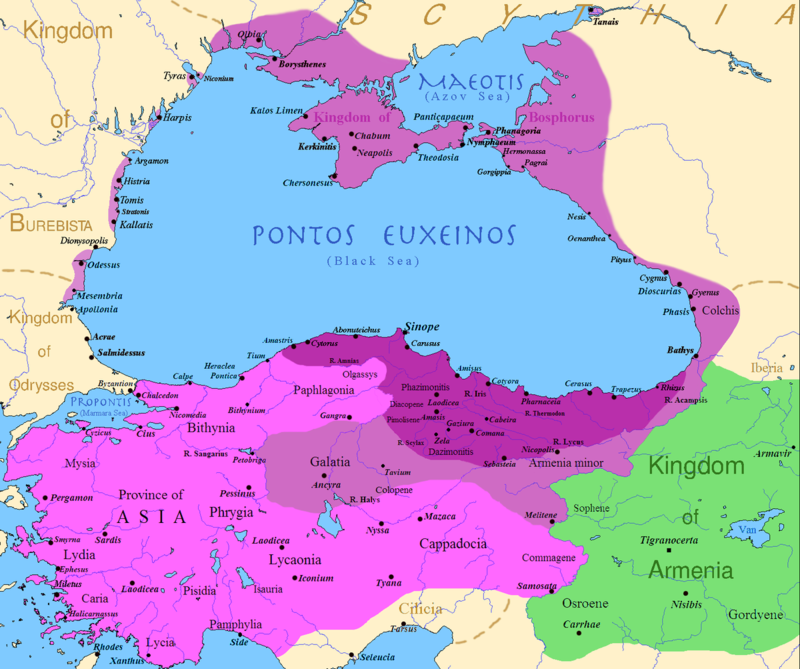 The Kingdom of Pontus or Pontic Empire was a state founded by the Persian Mithridatic dynasty, which may have been directly related to Darius the Great and the Achaemenid dynasty. The kingdom was proclaimed by Mithridates I in 281 BCE and lasted until its conquest by the Roman Republic in 63 BCE. It reached its largest extent under Mithridates VI the Great, who conquered Colchis, Cappadocia, Bithynia, the Greek colonies of the Tauric Chersonesos, and for a brief time the Roman province of Asia. After a long struggle with Rome in the Mithridatic Wars, Pontus was defeated; part of it was incorporated into the Roman Republic as the province Bithynia et Pontus, and the eastern half survived as a client kingdom.